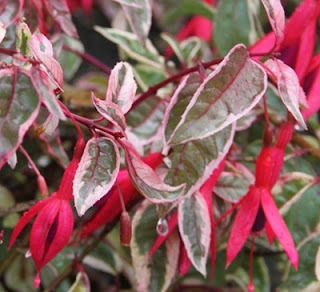 Fuchsia 'Tom West' is a popular hardy, evergreen subshrub (though deciduous in cooler, northern European climates), notable for both its ornamental foliage and colourful blooms. It is a sport selected by the French breeder Meilliez in 1853 from the species 'Corallina' (although proven to be more tender), and also makes for an excellent choice for planting in patio pots and and containers. 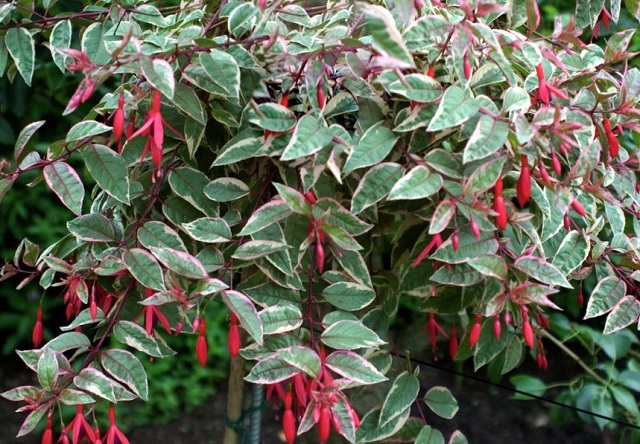 Under favourable conditions you can expect Fuchsia 'Tom West'to grow to a height and spread of between 0.2-0.5 metres. It has an upright habit with vigorous, lax growth. The leaves are variegated cream and green, with cerise veins and stems. The small, single flowers have red tubes and sepals with purple corollas, and purple flowers appear from June to September. Fuchsia 'Tom West' will grow happily in sun or part shade, and in a sheltered position. Plant into a light, well-drained soil, and fertilize monthly with a liquid soluble fertilizer, from spring through to July. When growing as a container plant, use a good quality, well drained compost such as John Innes No.3. Pinch out the growing tips of young specimens, to promote bushier growth and more flowers. Prune back to ground level in the spring, for a strong flush of new growth.